Oak trees are icons of the British countryside. These pages will help you to identify the different types of oak trees which grow around the world. 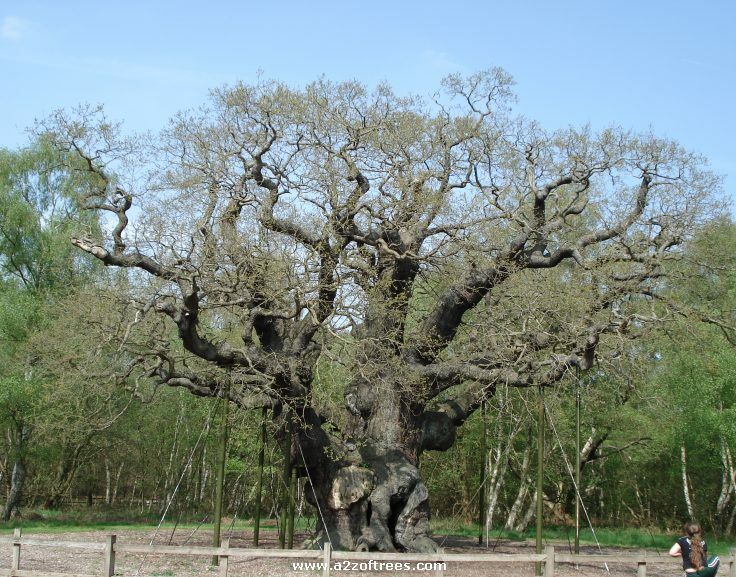 Two oak trees are native to the UK, the sessile oak (quercus petraea) and the English oak (quercus robur). But around the world there are approximately 500 species of oak tree. Most are deciduous but some like the Holm (or Holly) Oak (quercus ilex) are evergreen. Click here for our oak tree identification page with lots of pictures and descriptions to assist in identifying specific species. For more information on the Major Oak (pictured top left), one of the most famous oak trees in the world, click here. The leaf shape of the various oak species also differs considerably from the traditional lobe shape to those with a long and narrow shape. On the right is a picture of the leaf from the Common Oak. One identifier of an oak tree that does remain constant is that they all produce acorns. But even then acorns differ considerably between varieties, both in shape and size. The life span of an oak tree is variable but some examples can live as long as a thousand years. They provide food and shelter for a wide variety of other plants and wildlife. In part this is because the canopy of most oak tress allow lots of light to reach the ground below. The leaves decompose quickly and the acorns provide for the common rabbits, wood-pigeon, grey squirrels and mice. Plants such as hollies, brambles, ferns and primroses are very suited to growing near oak trees. PICTURE OF ACORN Oak trees start to produce acorns when they are around 30 years old. 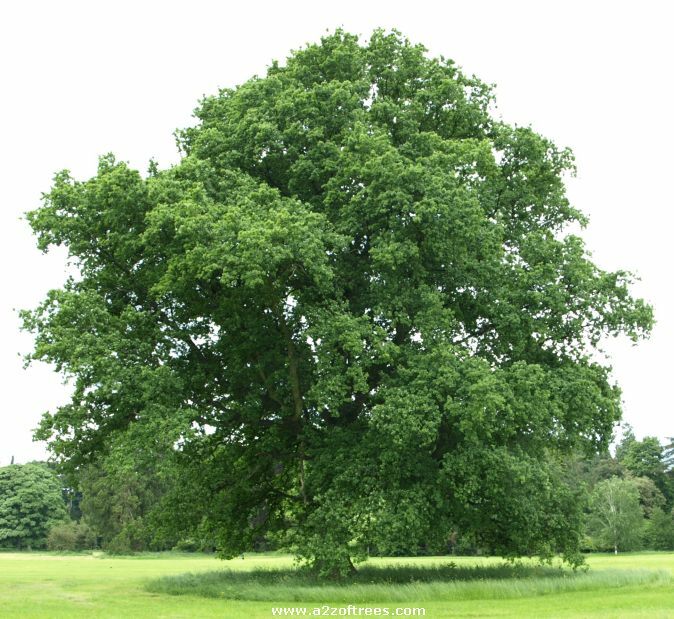 An average mature oak tree will produce roughly 2,000 acorns a year. When an acorn falls to the ground it has a one in 10,000 chance of growing into a mature oak tree. Around early May time the oak tree will produce male and female flowers. Pollination is achieved by a mixture of wind and insects. The pollinated female flowers develop into acorns which fall to the ground in September. Their chances of surviving are minimal. Many acorns are covered by leaves and rot, others are eaten by animals. If an acorn does survive, the seed within the acorn feeds on the bulk of the acorn and roots into the ground. The whole process then starts again. Oak trees need a fertile and moisture retentive soil to thrive. The average mature oak tree will absorb around 40 gallons of water from the surrounding soil every day. More in summer, less in winter. The oak trees we see today are what is termed 'climax vegetation'. In other words they are, in relative terms, new comers in the evolution of vegetation. When the ice age in Northern Europe started to end 15,000 years ago, willows and junipers evolved. As the ice retreated further birches and pines evolved. Last in the cycle came tree such as the oak, hazel and alder. Acorns will readily sprout into sapling oak trees with minimal care. 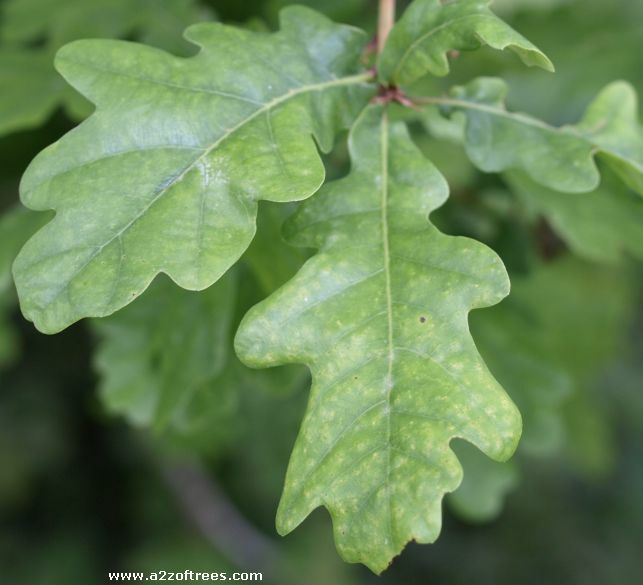 Click here for our page on how to grow oak trees from acorns with step by step instructions and advice. Photo by Haruta Ovidiu. www.forestryimages.org. The Oak Processionary Moth is moving northwards through Europe and has now reached London. The larvae (caterpillars) become active in mid April through to early June. They feed on the foliage of oak trees causing damage but they are not known to kill trees. The moth's name comes from their behaviour of exiting the nest to the feeding area in a procession. The hairs on the larvae can irritate human skin, in some cases badly. This is caused by the fungus Phytophthora ramorum. First identified in California in 2000, it spread to other parts of the USA and has now reached many countries in Europe. The principal symptom of Sudden Oak Death is the presence of splits in the bark at low levels often with black sap coming from them. The leaves can also be affected with dark marks on them. The disease as spread by wind and rain splash back. Although oaks suffer from this disease it is more common in other plants such as rhododendrons and horse chestnut trees. Photo by Joseph O'Brien, USDA Forest Service. www.forestryimages.org. The causes of Oak Decline disease are not fully understood but it is thought to be caused by a combination of fungus, pest and general condition of the trees. The tree will first show the symptoms of yellowing and unhealthy looking leaves. It will then literally die from the top down. Branches may grow at the top but they will have no foliage. This gives the tree an appearance of a stag's antlers at the top. The disease can kill an oak in as little as 3 years. Oak Decline affects oak tree worldwide and has been know to exist as far back as 1900. It affects trees in waves with 10 or 20 years separating the occurrences.